Thyme (Thymus) (pronounced 'time') is a genus of about 350 species of aromatic perennial herbaceous plants and sub-shrubs to 40 cm tall, in the family Lamiaceae and native to Europe, North Africa and Asia. A number of species have different chemotypes. 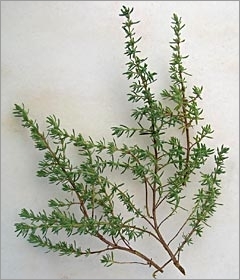 The stems tend to be narrow or even wiry; the leaves are evergreen in most species, arranged in opposite pairs, oval, entire, and small, 4-20 mm long. The flowers are in dense terminal heads, with an uneven calyx, with the upper lip three-lobed, and the lower cleft; the corolla is tubular, 4-10 mm long, and white, pink or purple.